Despite all the violent swordplay, beheadings and suicides found in kabuki dramas and samurai lore, for most of its history ukiyo-e rarely depicted much blood. As time went on print buyers were treated to more and more realistic renderings of scenery and animals and weaponry, but no attempt was made to give a more natural look to the gore. Today, collectors associate blood on woodblock sheets with the designs that the Edo artist Tsukioka Yoshitoshi (1839-92) and others executed in the mid-1860s, during a time of severe hemorrhaging in the Shogunate. However, an exploration of the graphic power inherent in making bloodstains the center of a composition can be found in the Osaka ukiyo-e record a good 15 years earlier. Fig. 1 illustrates a deluxe, surimono-style theatrical ôban by the Osaka artist Hirosada (active 18?? - 1863; d.1865). The actor, identifiable by his physiognomy (and the "ki" and "rô" characters on his robe) is the Edo superstar Onoe Kikugorô III (1784-1849). In 8/1848, Kikugorô emerged from brief retirement, changed his name to Okawa Hashizô, and decamped to Osaka to tread a few more boards. In hot weather, Japanese like to experience horrific stories that make them shiver, and Hashizô obliged everyone at the Kado Theater with Sangoku ichi tsuino kuromono (A Pair of Blackguards: The Best in the World), in which he starred as Shirai Gompachi. The legendary Gompachi was an outlaw notorious for his youth, good looks, and the bad end he came to because of women. There are numerous variations on exactly how, but in this re-telling fugitive Gompachi finds himself trapped at night on a boat, and in a "You’ll-never-take-me-alive!" moment of defiance, opts for suicide. Samurai ideally had an aide at the ready to sever the head from the body the moment they sliced their own belly hara-kiri-style. Gompachi, all alone on the boat, seems to have decided to only half-execute the second step of the ritual, leaving his body still upright, propped against a bamboo pole with ghoulish bravura. Hirosada took this pose (curiously, Hashizô himself was to die five months later) and created one of the most haunting works in all ukiyo-e. The revered print scholar Roger Keyes (in a book and in talks) admiringly points out its strong vertices, the profound mood shifts as the eye goes from element to element in the composition, and how the poem (printed in silver on the black-as-death sky) alludes to the brief but glorious life of the outlaw: Flowers of the mountain cherry; praised as they fall. Most of all, however, Keyes (and we) are struck in this print by the audacity of the bloodstains — the drippy, splotchy aftermath of wounds to the stomach and neck rendered (at times via blind embossing and the careful overlaying of pink and crimson pigments) with forensic-like precision. No precedent comes to mind for such extravagant use of sanguine, certainly not in the quietist Osaka print world where the addition of even a small drip of blood for scary effect on the head of a ghost was remarkable. And nor did Hirosada’s ambitious, pioneering effort start a vogue there. Precious few Gompachi impressions seem to have been preserved, (even for a limited edition surimono, it is rare), and only a tiny handful of bloody actor designs followed -- all in the less prepossessing chûban format. 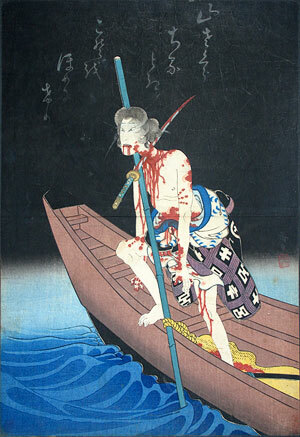 Perhaps Osakans simply had no stomach for gore. By 1863, however, much of Japan was clearly thirsting for series after series of chimidoro-e (blood-stained prints), and Yoshitoshi in Edo succeeded in seizing the zeitgeist ... to Tarantino-like critical and public acclaim. This article originally appeared in Daruma, no. 63, Summer 2009. Copyrighted © text and pictures reprinted with permission.